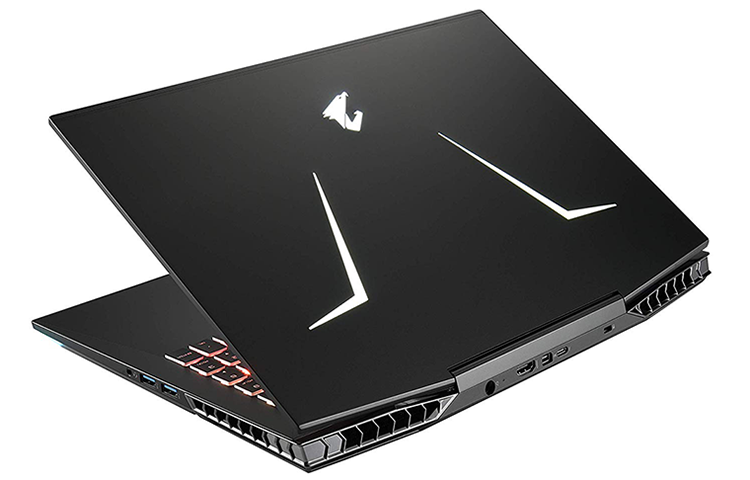 The recently announced Aorus 15 gaming laptop comes as a pleasant surprise. We had expected the Gigabyte subsidiary to simply refresh its existing X5 Series with GeForce RTX innards, but the X3, X5 and X7 have all been marked as end-of-life, and though we suspect successors may be unveiled at Computex, we now have an all-new alternative to consider in the meantime. So, what is this mysterious Aorus 15 and where does it fit in? 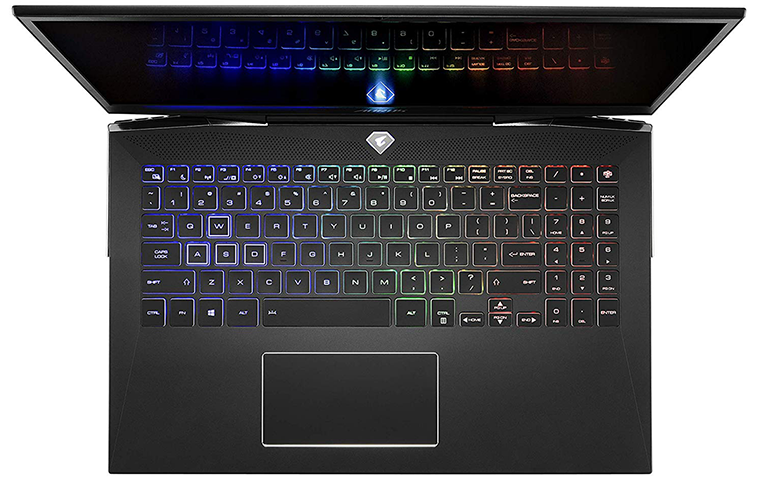 Whereas the X5 served as a premium choice for gamers seeking high-end components in a super-sleek package, the new 15 is toned down in favour of a more attractive street price. The supposed downgrades are evident when it comes to size and feel. Dimensions of 361mm x 246mm x 24.4mm aren't particularly bulbous for a gaming laptop of this ilk, yet the slight increase in thickness is felt, with the Aorus 15 coming across as chunkier than its X5 predecessor. There's still some flex to the display lid and keyboard tray, yet overall build quality remains suitably strong, and we suspect most gamers would happily take the so-called 'lesser' chassis if the price is right. What sort of figures are we talking about? Well, prices seem to have dropped somewhat quickly in the weeks following launch. The entry-level model that we have in for review features RTX 2060 graphics and currently retails at £1,750. What's interesting is that the next model up raises the bar with RTX 2070 graphics and costs little more, coming in at £1,800. Both feature a Core i7-8750H processor, 16GB of DDR4 memory and a 512GB M.2 SSD, and unless we're mistaken, the £1,800 SKU is, at the time of writing, one of the more affordable gaming laptops to come equipped with RTX 2070 graphics. 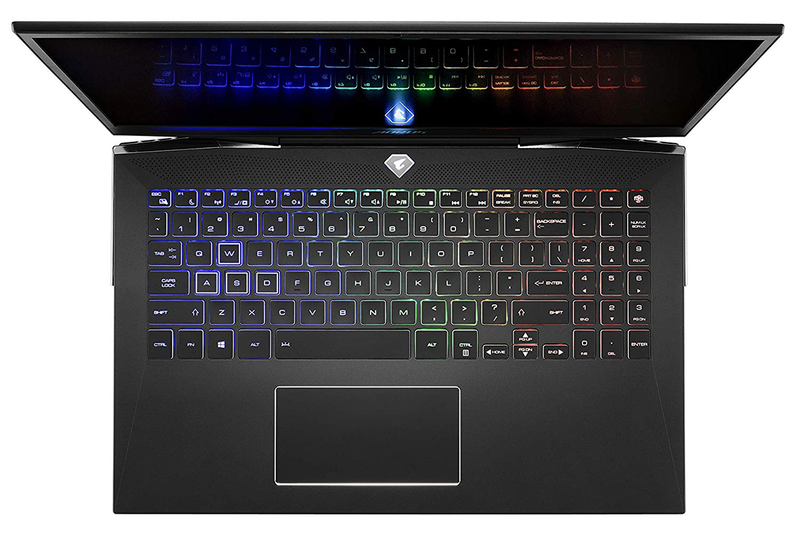 Given that the Aero 15 from parent company Gigabyte already caters for prosumers willing to spend big for gaming credentials, it makes sense for the Aorus equivalent to be aimed squarely at enthusiast gamers on a budget. 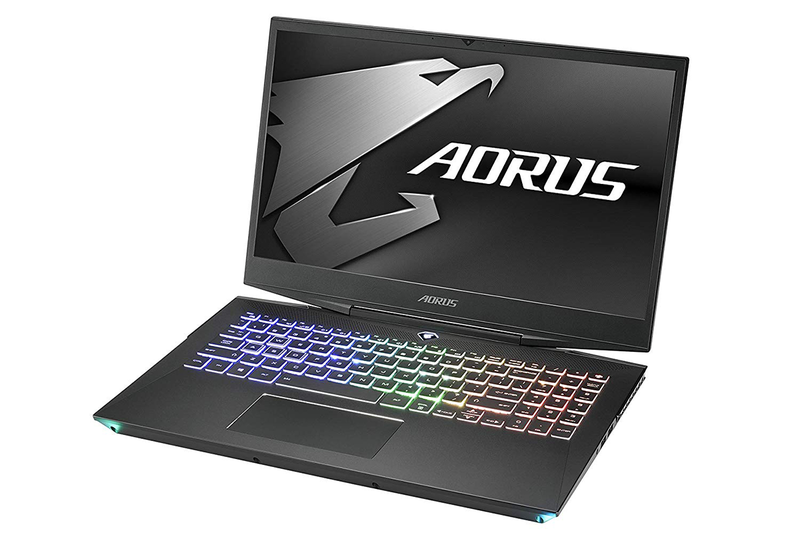 That being the case, it is no surprise to find that the Aorus 15 is more overt than the admittedly much dearer Aero. The keyboard is eye-catching due to the white surrounds that emphasise the RGB lighting, the angled gaps between the display lid and keyboard tray are an acquired taste, and the LEDs that shine from the front corners of the system are just unnecessary. On the other hand, the Aorus is some £600 cheaper than the Aero, and though you sacrifice elegance, you get plenty in terms of horsepower. Our entry-level review unit packs an Intel Core i7-8750H processor, 16GB DDR4-2666 in a dual-channel configuration, a 512GB Intel 760p M.2 SSD, a 2TB hard disk for secondary storage, and Nvidia GeForce RTX 2060 graphics. That's a full-fat GPU, by the way, not a weakened Max-Q offering, and it is well-suited to the 15.6in IPS panel armed with 1,920x1,080 resolution and fast 144Hz refresh rate. 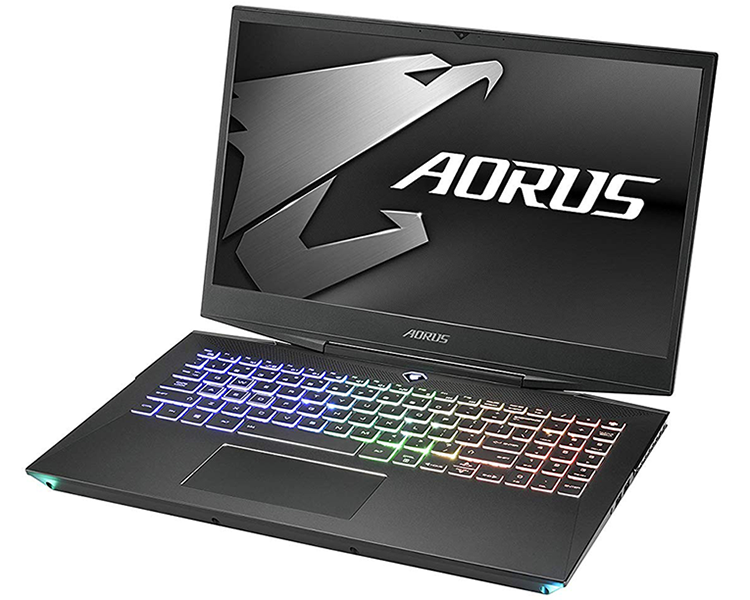 There's plenty of room around the sides for generous connectivity options and Aorus doesn't disappoint. The right side is home to a pair of USB 3.1 Type-A and an audio jack, over on the left there's Killer Gigabit Ethernet, another USB 3.1 Type-A, and a microSD card slot, while around back you'll find USB 3.1 Type-C, mini-DisplayPort 1.3, HDMI 2.0, as well as a connector for the 180W external power supply. It's a shame there's no love for Thunderbolt 3, but what's most strange is the lack of support for Nvidia Optimus. We're accustomed to seeing gaming laptops automatically switch between the Intel IGP and Nvidia GPU in order to preserve battery life, but the Aorus 15 relies on the GeForce at all times. We had assumed this to indicate support for G-Sync adaptive framerate synchronisation - G-Sync and Optimus are mutually exclusive, so it tends to be one or the other - but the Aorus 15 goes without either technology, and we suspect there might be some repercussions in the upcoming benchmarks. In terms of usage, the backlit keyboard has a smooth action with a good amount of key travel - though we'd argue the inclusion of a numpad makes it a little cramped - and the precision trackpad is really nice and large. Sound output from the upward-firing stereo speakers also packs a surprising punch, and in keeping with other recent Gigabyte laptops, we like the fact that the Aorus 15 takes a relatively clean approach to software and presentation. Many of the usual branding stickers are lumped together in one easily removable sticker on the palm rest, and there's little in the way of bloatware. Whether or not the Windows installation will be deemed 'clean' depends on your appreciation of Gigabyte's persistence with AI. Powered by Microsoft Azure, the pre-loaded AI software claims to maximise performance by using machine learning to dynamically distribute power to CPU and GPU depending on workload. Our previous testing has shown negligible real-world benefit, and given that users need to allow Gigabyte to collect usage data in order for the AI to function, we suspect most enthusiasts will simply choose to turn AI off.